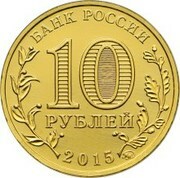 In the center of the disc – the indication of the denomination of the coin "10 РУБЛЕЙ" (10 RUBLES). Inside of the figure "0" – hidden pictures of the figure "10" and of the inscription "РУБ" (RUB) visible by turns on changing angle of vision. Along the rim – circular inscriptions, on top: "БАНК РОССИИ" (BANK OF RUSSIA), on bottom – the date: "2015", to the left – the stylized image of a laurel branch, to the right – of the oak one. 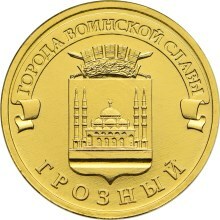 The coat of arms of the town of Grozny, over it, on a ribbon – the semicircular inscription: "ГОРОДА ВОИНСКОЙ СЛАВЫ" (TOWNS OF MARTIAL GLORY), below – the inscription along the rim: "ГРОЗНЫЙ" (GROZNY).